A large central sunburst chandelier still hangs from the ceiling of Spokane’s historic Fox Theater. Also intact are elaborate murals, plaster ornamentation and even the original painted fire safety screen at the stage opening. But nine small chandeliers representing the stars of the universe are missing. They once hung above the balcony at the rear of the theater. The people who are in charge of a $22 million Fox renovation say they would like to have at least one of the chandeliers back. “If we can find one, we can replicate them,” said Betsy Godlewski, development director for the Fox Theater organization. Godlewski said Wednesday that the chandeliers may have been removed when the theater was converted into a tri-plex movie house in the 1970s. She suspects that some were moved to new locations and that their current owners might be willing to donate them back to the theater. At least two historic photographs show the missing chandeliers, but neither of the photos provides enough visual detail to make replicas. Also missing from the building are a series of other light fixtures that decorated the north vestibule and lobby area, as well as sofas and tables with chairs that lined the lobby. “They were just amazingly beautiful,” Godlewski said of the missing furnishings. 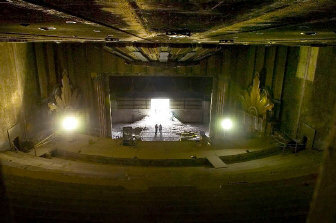 Many of the floor-level decorations have been covered with foam to protect them during the work, and the theater’s ornate ceilings and walls are scheduled for restoration during final stages of construction. The most dramatic fixture of all – the massive 60-foot-wide sunburst chandelier – remains securely fastened just in front of the stage. It is the focal point of an ornate plaster ceiling that hangs from the roof by scores of wires. It turns out that the most difficult task in the restoration will be keeping the plaster ceiling and sunburst chandelier in place during installation of a new heating and cooling system. That system must go inside a 20-foot-high attic space without disturbing the ceiling. The job will involve putting steel support structures into the attic to hold the new equipment. Construction Superintendent Dennis Snyder of Walker Construction of Spokane said he plans to install a new concrete floor first and then erect massive scaffolding inside the seating area to hold the entire theater ceiling in place during installation of the new cooling equipment. Snyder said he doesn’t want to risk cutting a hole in the roof because any unexpected rain could damage the plaster, murals and furnishings. Instead, he said workers will probably cut a hole over the projection booth at the rear of the theater and move new steel and equipment into the theater by crane. The new heating and cooling system will replace an early-day air conditioning system that, in its time, added to the allure of the 1931 theater. Movie theaters such as the Fox were erected at a quick pace – as many as 400 to 500 a year – as the popularity of film swept the country, a consultant said in May. William Fox of Fox West Coast Studios, later to become 20th Century Fox, presided over construction of nearly 280 Fox theaters around the country, using teams of designers and artisans in each city. Fox theaters in Atlanta, St. Louis and Stockton, Calif., are among those that have been restored. Six years ago, the Fox was saved from demolition when 900 donors gave $1.1 million to a Save the Fox fund. State lawmakers have appropriated $6 million for restoration through the Fox Theater organization, a nonprofit affiliated with the Spokane Symphony. Another $9 million has been raised through other public and private sources. More donations and tax credits are being sought. The original construction, at $1 million, included a full-height stage house, orchestra pit, dressing rooms and movie screen to accommodate different types of entertainment. When the current project is completed in late 2007, the reconfigured theater will have 1,725 seats and will become the new home for the Spokane Symphony and a venue for regional performing groups. The Fox Theater organization may be reached by telephone at (509) 624-5992; by e-mail at info@foxtheaterspokane.org. ; or on the Web at www.foxtheaterspokane.com/.